This recipe makes a large pot of stock. Use what you need for the Pot Pie Soup and freeze the rest in quarts for later use. 1 whole chicken, 2 to 3 lbs. Season chicken with salt and push two cloves into one of the chicken thighs. Add to large stock pot, cover with 4 quarts of water and bring to a simmer over medium-high heat. Add carrots, celery, onion, garlic and thyme. Bring to a gentle simmer and skim surface as necessary. Lower the heat, and simmer 45 minutes to one hour until chicken is tender. Adjust seasoning. Remove chicken to a baking sheet and allow to cool for a few minutes. Remove and discard thyme bundle. Take the breast and thigh meat off the chicken. Break chicken into bite-size pieces. Set aside. In a large pot or Dutch oven, melt the butter and saute onions over medium heat for 10 minutes or until softened. Add flour and cook over low heat, stirring for 2 minutes. Add hot chicken stock to the onions. Simmer until thickened, 1 to 2 minutes. Add salt and freshly ground pepper to taste. Add heavy cream, carrots, peas, pearl onions and parsley. Mix well. Simmer 5 to 10 minutes, or until vegetables are tender. Preheat oven to 400 degrees. Thaw puff pastry according to package directions. Do not unroll pastry sheet. Cut evenly into 4 pieces. Brush with egg wash and sprinkle with Parmesan cheese and cracked black pepper. Bake 20-25 minutes until puffed and golden brown. Divide filling into soup bowls and place puff pastry on top. That puff pastry balancing on the side like that. It looks so good and I like the idea of sort of breaking down the chicken pot pie. Great job! wow, that puff pastry biscuit looks amazing!! 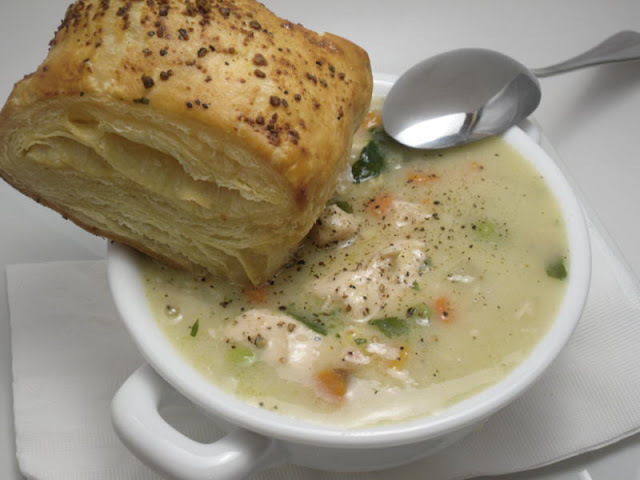 and what better comfort food than any pot pie, as a soup with that biscuit its heavenly! What a dear you are for sharing this recipe. My husband just loves chicken pot pies and I've never made one from scratch. Yours looks and sounds incredible. Love the puff pastry biscuit topping! Hi. I'm stopping by from the blog party. It's nice to meet you! Your recipes look delicious! I'm now following you here and on facebook. Hope you'll have time to check out my blog! Hi! Swinging by from UBP! I love chicken pot pie...yum!